A quick and easy introduction to key XML technologies. Extensible markup language, or XML, consists of tags indicating the content of the data contained on a page. The neutral, platform-independent format of this mark-up language makes it possible to feed different output channels (Web, WAP, Print) from one information source. 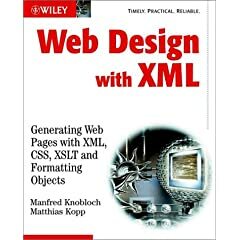 In this quick and easy introduction to key XML technologies, Web Design with XML adds another dimension to XML, demonstrating how to generate visual output using XML DTDs, Namespaces, CSS, XSL, and XSLT, all illustrated with examples. Web Design with XML is a quick and practical introduction to key XML technologies for the busy web designer. Featuring easy to use techniques and clear examples, Manfred Knobloch and Matthias Kopp show how to remodel XML documents into useful and attractive webpages. The book provides introductions to XML DTDs, Namespaces, CSS, XSL and XSLT with examples that illustrate how the concepts can be used. All examples are available for download on the accompanying website and can easily be used for server-side webpage generation as well as client-side rendering. The appeal of XML lies in its capacity for content management. When using it in web design the task of the technology should be to implement requirements as closely as possible. By using Web Design with XML you can ensure that your webpages are as efficient, manageable and user-friendly as possible. Think of a tag as a keyword or label you consider is strongly related to this product. Tags will help all customers organize and find favorite items. Our Harry Potter Store features all things Harry, including books, audio CDs and cassettes, DVDs, soundtracks, and more. Find great titles at fantastic prices in our Bargain Books Store. Save 40% on The Significant 7, our favorite picks for the month.